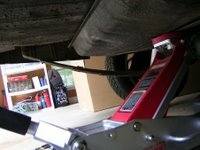 It seems that my writings ridiculing a dubious gas mileage gadget have attracted some readers to this blog who are wondering what it really takes to supercharge any car. Well, putting in a real supercharger is not particularly easy or cheap, and some cars have features that will complicate matters. But it is possible to write a generic set of supercharger instructions, so as to give you the general idea of what's involved with installing one. First, I should start off by explaining what a supercharger is. A supercharger is an air pump that pushes more air into the engine. Drawing more air into the engine allows you to burn more fuel, which lets you make more power from the same size engine. The supercharger needs power, and a fair amount of it. The power required to drive a street supercharger can be as little as five horsepower or as high as sixty. The supercharger on Top Fuel dragsters require hundreds of horsepower to drive. You could drive one with a turbine in the exhaust – a device that does this is known as a turbocharger. These have some other complications, so I won't talk about them in this little article. Here, I will focus on superchargers that use a belt drive, the most common way to drive a conventional supercharger. Here is what it takes to install a supercharger, in 5 not particularly easy and grossly oversimplified steps. 1. First, you pick a supercharger. Adapting a piece of ventilation equipment isn't going to cut it; you need one that is optimized for delivering the pressure you want at the airflow levels you need. Selecting a supercharger involves calculating how much air you want to flow into your engine and what pressure you want this air to be. Once you have these numbers, you compare your engine's needs to graphs called compressor maps that you can get from the supercharger's manufacturer. There is no one size fits all supercharger, or even one that fits a wide variety of cars from 1.5 to 5.1 liters. If anybody claims to have a single “supercharger” that will be equally effective across a size range like that, the only way it could be equally effective would be if it fails to do anything for any sized engine. At this point, you will have to decide whether you want a centrifugal supercharger or a positive displacement one. Positive displacement superchargers put out nearly constant boost at any engine speed, making them a good choice if you want low RPM torque. Centrifugal superchargers are lighter and more efficient, but the boost builds with engine speed. So a centrifugal supercharger is not going to do much at low RPM. Their extra efficiency, however, means that theoretically you should get more performance for the same amount of boost. 2. Next, you have to find a good way to get the supercharger physically on the engine, positioned in such a way that you can set up a pulley to drive it. There are two ways to go about doing this – you can make a new intake manifold and attach the supercharger to that, or you can attach the supercharger to a bracket like it's an overgrown alternator. Usually positive displacement superchargers attach to the intake manifold and centrifugal units use brackets, but there's no absolute rule about which way to do this. 3. Then you need to rig up pulleys to turn your supercharger. You may be able to just line the supercharger's pulley up with the other pulleys and put on a longer serpentine belt. Or you may need to add a new pulley to the crank and use a large, toothed belt called a Gilmer belt to drive it. This will depend to some extent on just how much power your supercharger needs to drive it. In theory, you could build an electric supercharger, but you'd need a very large motor driven with wiring the size of battery cables if you wanted it to make any horsepower. It would also put an enormous strain on your charging system. Remember, an effective street supercharger is going to need somewhere between five and sixty horsepower to turn it. You can't get that kind of power out of a motor the size of a D cell battery, or pack enough current to drive it through a 12 gauge wire. I've also heard of someone working on a hydraulic supercharger, but I never heard of such a thing turning up on the streets or the racetrack. 4. Next you will have to deal with plumbing. If you've mounted your supercharger on a bracket, you will need to run a tube from the discharge side of the supercharger to the throttle body. You can also put an intercooler somewhere in this length of tube to cool down your incoming air, which will be hotter after it leaves the supercharger. Cooling down the incoming air will boost efficiency and make your engine less likely to ping. Some superchargers will require external oil supply lines as well; most don't. You will also need to find some way to get filtered air to the supercharger's intake, even if you have a manifold-mounted supercharger. 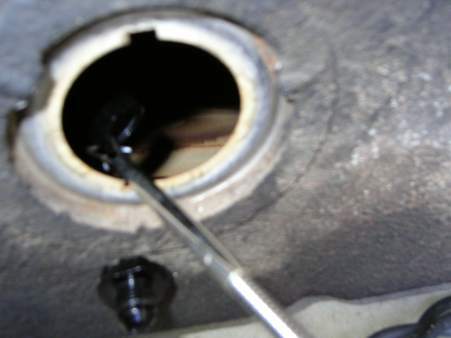 And if you've moved the throttle body, you may need to change the throttle and transmission kickdown linkage. Or maybe not. 5. Then you will need to tune it all. 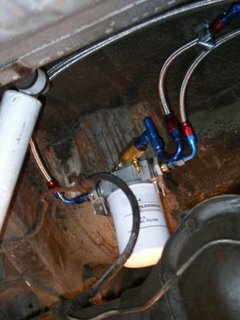 At this stage, you may need to add a larger fuel pump or larger injectors to get more fuel into the engine. If you have an injected motor, you'll benefit from tuning things with either an adjustable fuel pressure regulator or ECU mods. Cabureted motors will likely need new jetting and recurving the distributor. You may even need different pistons if you are particularly unlucky - or going for all out power. You may need to move a few things in the engine compartment out of the way for some of the above steps. The most common one is having that pesky hood refuse to close until you cut a hole in it, but there are all kinds of other things that may need relocation assistance. A recent Grassroots Motorsports project where they tried to put a supercharger kit for a BMW Z3 roadster onto a 318 (BMW, not Mopar) required relocating the master cylinder reservoir, for example. If you are putting in a supercharger from scratch, any one of those steps could be the subject of a whole magazine article. If you are buying a kit, the kit's manufacturers will hopefully provide detailed instructions that make these steps no harder than changing your alternator. Any real supercharger is going to be somewhat complicated and expensive to install. But as you can easily get 50% more horsepower, many would say it's worth it. Well, I hooked up the vacuum lines for the Turbo Dart today. This was pretty simple - the only things that use vacuum are the Megasquirt, the boost gauge, and the fuel pressure regulator. I should plumb in a compressor bypass valve, too, but that'll probably wait until I get the intercooler in place and plumbed up. The only really tricky thing was sometimes finding the right lines. The vacuum port I have is 3/8", the boost gauge uses 1/8" hard line, and the remaining two ports were 3/16". I finally made some adapters with parts from Ace Hardware. Not much wrenching left before I can turn the key and try to crank it up! Mostly, I just have to get a little wiring done. Because I just hate to have project cars apart at the same time. Kelly talked me into test driving a beat up old Volvo 240 station wagon today. She's really wanted to get a Swedish brick for a while. After talking it over, we decided getting one (not necessarily the one we drove) would be a real possibility if I could enter it in the Grassroots Motorsports $2007 Challenge. I'd probably want to put a turbo on it for that. Good thing the local junkyards are well stocked with old Volvos. At least there isn't all that much left to hook up on the Dart. Next week expect to hear a lot about my work on vacuum lines and the remaining wiring. I've got the new handlebars on. Put on a set of dirt bike gel grips while I was at it. The grips fit just fine, and they seem pretty comfortable. They even have the sort of look I want to get for the bike by the time it's done. The only problem is that the bars aren't exactly made to work with the Windjammer; it doesn't look like I can turn them to full lock. The brake and clutch levers hit the fairing. The Emgo fairing will take a while longer to install. I'll have to fab up some brackets out of aluminum, and do something about the wiring. It's a real rat's nest of splices right now. Thanks to LoDownSinner at the Beginner Bikers forum for helping me figure out why the throttle wouldn't turn on the new handlebars. I'd seen on a message board that a guy in Jasper was parting out a couple CX's. So last night I finally stopped by his place, as he'd said he had a set of turn signals I could use. Unfortunately, I'd forgotten to specify that I needed the signals for a standard CX500. He had one of the Custom models. Now, it's possible to put the turn signals from a CX500 Custom onto a plain old CX500. Unfortunately, it's not going to look right unless you grab practically the whole front end - headlight housing and instrument cluster. And he'd taken the gauges off his parts bike to put on another bike that was now sold. Well, what we worked out reminded me of those Rolling stones lyrics. "You can't always get what you want, but if you try sometimes, well, you just might find you get what you need." He had a small cafe racer style fairing, practically brand new. And he had some sporty looking handlebars to go with it. I can just find some aftermarket turn signals and put them on this fairing, and that should give me a replacement for the Windjammer. It's Ride to Work Day. Looks like the official day to ride your motorcycle to work has gone over pretty well here in the Atlanta area. I saw quite a few people riding around on a wide variety of motorcycles - cruisers, sportbikes, old standard bikes, a maxi-scooter, and even a Go-Ped type scooter. Unfortunately, I wasn't able to participate on account of currently being unemployed. Anybody want to hire a mad scientist? In addition to my knowledge of cars, you could also hire me if you happen to have a four kilowatt laser lying around and need someone to get it running right. Seriously - here's my resume. You didn't think I was kidding about the lasers, did you? After that last post, I decided just for fun to track down a method of putting forced induction on at least one mini-truck from every major manufacturer that sold minitrucks in the United States. I'm afraid I don't have many details on most of these, but this may get you a few ideas. 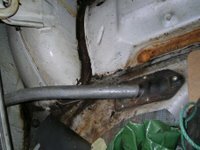 Many Nissan Hardbody trucks used the same KE24E motor as in the '89-90 240SX. You can adapt one a turbo kit meant for a 240. Toyota built a handful of their trucks from '85-'87 with the 22RTE turbo motor. TRD makes a supercharger kit for some of their later Tacomas, too. It's possible, as I mentioned before, to put a Mitsubishi 4G63 motor into a Mighty Max or a Dodge Ram D50. Some Dodge Dakotas came with the Chrysler 2.5. It's possible to put a 2.2/2.5 Turbo from a K-car into one of these. Note that some others came with the AMC/Jeep 2.5, and you can't swap those. You can swap the old 2.3 straight four in '80s and '90s Ford Rangers for the 2.3 Turbo used RWD Ford performance cars. On '80s era Mazdas, you can swap in a F2T motor from a Probe or MX-6. Or go with a turbo FE3 - while this motor wasn't turbocharged from the factory, evidently the F2T's turbo hardware bolts on. With Chevy, GMC, and late model Isuzu minitrucks, there's an off the shelf supercharger kit. There's a number of supercharger kits out there for the Jeep 4.0 inline six. One made for a Cherokee ought to fit their Comanche pickup. I've also heard of turbo versions of the car-based pickups - VW trucks with a 1.8 Turbo, force-fed Dodge Rampages, even El Caminos with Grand National power. I've been contemplating getting a mini-truck. But if I did, I'd probably have to drive it a lot, so it would have to be a fun to drive mini-truck. I did a bit of asking around on the Grassroots Motorsports board, and learned that you can put a Mitsubishi 4G63 in a Mighty Max or Dodge D-50 pickup. For the majority of the population who don't speak Mitsubishi, that's the motor found in the turbo Eclipse, Lancer Evolution, and Galant VR4. So I decided to search for what's involved with the swap. Turns out the block will bolt right up to the stock motor mounts, and if the truck originally has a 2.0 liter motor, the transmission will bolt up. Biggest sticking point is the throttle body, which would be pointed straight at the firewall unless you modify the manifold. This site has a lot about what you need to put a 4G63 into a Mitsubishi Mighty Max. Apparently with some versions of the Mighty Max, it's also possible to put the 4G63 cylinder head on the original block. I also suspect it's easiest to do this with a '90 or later truck as those models had EFI from the factory. Plumbing up a fuel system on a vehicle that the designers never intended to have EFI can be a real pain... as I'm all to well aware. While I'm not sure what the odds are that I'll actually try that, this swap has a very appealing combination of cheap and devious. It's time for another episode of Mechanical Mythology! 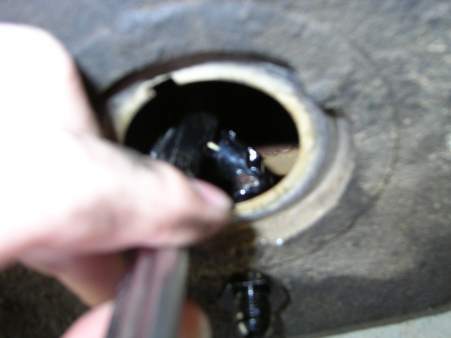 Here, we deal with the pressed-in plugs on the side of an engine block. They're about 2" in diameter, and most people don't have to deal with them unless they start leaking. They are popularly known as freeze plugs, but this is something of a misnomer. 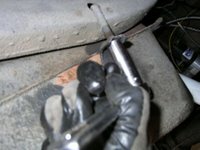 Claim: Freeze plugs in an engine block are there to protect the block from the coolant freezing. It seems logical that freeze plugs are meant to guard against ice. They are simply pressed in, so too much pressure behind them will press them right back out. So it seems this could save you from a cracked engine block if you didn't put in enough antifreeze. Actually, that's not what they are there for, and the manufacturers don't even call them freeze plugs. The term they use is core plugs. And the holes they occupy are not there for any reason other than making the engine easier to manufacture. The holes in the block are not for ice, but for sand. All cast iron blocks, and some cast aluminum ones, are made by sand casting. The mold is a mixture of sand and clay. Cores are special pieces of the mold that fill hollow scections of the metal, such as the water jacket around the cylinders. A system of pins reaches in through holes in the block to support the cores. After casting the block, the core breaks up, and workers remove the sand from the core out the same holes. Then they cap the holes with the core plugs. And that is the entire reason for the core plugs. Unless you want to put a block heater in one. All the fuel lines connected! I just tightened the last fuel line connection now. 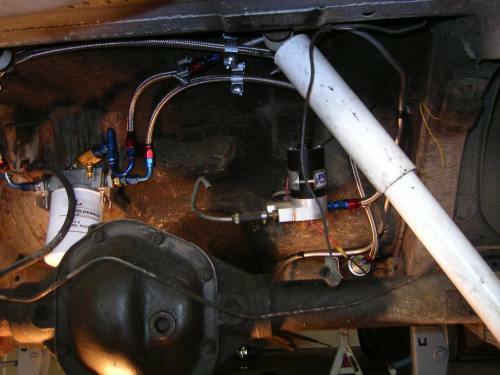 Not that the fuel system is all complete - I still have to reconnect the vent line on the fuel filler, wire up the fuel pumps, and put a bit of metal over the fuel lines where they cross under the parking brake cables so they don't wear out. But all the fuel lines are finally there. It looks like metal spaghetti in the area above the rear axle. But at least I was able to leave plenty of room for the axle to move around. Putting the return fitting in the fuel tank was rather tricky, probably one of the hardest places I've found to get a wrench on (although the Focus cabin air filter box comes close). Drilling the hole was no problem, but once I had the bulkhead fitting through, I had to put a gasket and a nut on there. And I can only get two fingers through that sending unit hole. As you may have guessed, I dropped the nut in there once. Had to get a claw tool and fish it out. Then I needed a tool that could fit in there to hold the nut while I tightened it down. Neither an adjustable wrench nor a normal ratchet wrench would be easy to manipulate. I finally stuck a U-joint on the ratchet wrench and bent it at a nearly 90 degree angle. I feel like I'm really close to the time I can finally turn the key and see what happens. I've been getting a bit more work done on the Dodge Dart's fuel lines. There is now only one hose left, the return line straight to the gas tank. With the gas tank out, I've used the chance to get some pictures of the fuel system that otherwise wouldn't be possible. The components, from left to right, are the surge tank, low pressure fuel pump, and high pressure fuel pump. Here's a close up of the surge tank. The installation turned out to be a little bit different from what I've shown when I introduced it, to make it fit in the space required. I had been using Summit AN fittings on my Dart, but I found earlier this week that I needed a few more that I hadn't ordered. Well, Summit Racing Equipment now has a store in McDonough, so I rode on over there to pick up some new fittings. They were out of the Summit house brand, so I bought some of the more expensive ones from Earl's. I'd been hoping to save a few bucks with the house brand. Well, today I started working with these fittings, and found out they don't remotely resemble the ones I had been working with. Took a few pictures, but they came out blurry - my digita camera has trouble focusing so close. Earl's fittings are so much easier to attach to the hoses, it's amazing. I am not going to use Summit fittings on a project car ever again. Coincedently, I ran across an article on Summit AN fittings today purely by accident. I had heard somewhere that Summit's fittings were rebadged Goodridge fittings, but it turns out they're cheap Chinese knock-offs. Had I known they were made in China, I wouldn't have cheaped out and bought them. I'm not exactly a rabbid "Buy American!" type, but I've usually found the quality of parts from Communist China to be anywhere from substandard to horrid. I'm starting to wonder just how well that 45 amp alternator on my Dart is going to work driving two fuel pumps, six injectors, and maybe an electric fan and stereo upgrades that I might put in sometime down the line. Bolting in a larger alternator is not hard, but the rest of the electrical system is not designed for such things, either. I've got a wiring diagram and can figure out which wires to replace with larger ones, but '60s era Mopars have one big bottleneck. They have an ammeter that carries all of the current between the battery and the alternator. While you could disconnect it and put in a voltmeter, I want to stay with the factory dash. So, I decided to ask for a little help from the gurus at Slantsix.org. I got some great responses, including K. Beard's step by step guide for adding a set of diodes that protect the ammeter. This one first appeared in Octane Magazine. Big thanks to Dan Stern, K. Beard, and 440 Magnum. A few glitches with the boards at Absolute Write had temporarly held up the third round of the AWChain. Now I'm picking up where Matt Dinniman left off, talking about Tae Kwon Do. I also took that sport when I was in elementary school, but I never got to do any of the chicken fighting that he talks about. This game, where combatants stand on one leg and try to knock each other over, requires one ability that is also very important to race car driving: Balance. Carroll Smith mentions that great race car drivers have an excellent sense of balance briefly in Drive to Win, but he doesn't really elaborate much on why this is important. This may just be that he figures anyone with experience at driving a race car will know why. I'm just a wannabe when it comes to driving race cars, but it didn't take me long to learn. I would say that one of the key reasons a sense of balance helps is that it allows you to gauge whether your car is starting to misbehave. In normal street driving, your car goes more or less where you point it. When pushing a car to its limits on a race track or autocross circuit, though, you're likely to feel the car starting to slide around. Usually street tires will also make a lot of squealing, but this isn't necessarily true with race tires. And often, the biggest clue that your car is beginning to slide doesn't quite seem to be what you see, as much as what you feel. You just feel that the car is starting to rotate in an odd way, that the back end is coming around or the car is going sideways. This skill can also be useful for street driving on icy pavement or other times you run out of traction. I've sometimes thought that one reason I often have trouble with racing video games is that they can't replicate this. Even with the force-feedback controls that you'll see at an arcade, there is no way to give the driver the sensation that the car on the screen is starting to slip. Video games take away one of the most important senses in racing. It's not quite like driving blindfolded, but sometimes it almost feels that way. Now I'm passing the AW Chain torch to Kelly Curtis, whose blog happens to be called "Pass the Torch." I decided that, no matter where I put the return line, I ought to remove the Dart's gas tank and clean it out. 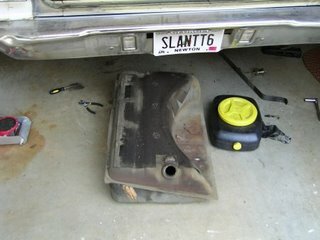 Removing the tank on a '66 model is not particularly difficult. Normally, the first step is to syphon the gas out, but I only had a few gallons in there, so I decided I would support it with a jack instead. Don't do that unless you know the tank is nearly empty. The first step is to disconnect the lines to the tank and the fill tube. The fill tube simply has eight screws holding it in place: Three around the gas cap, and five in the trunk floor. And there's also its vapor line that you have to disconnect. Once those are out of the way, you just need to twist and wiggle the tube out of its grommet. 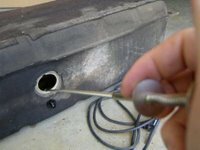 The only other two things you will need to remove are the fuel line and the fuel sender wire located at the front of the tank. The only thing holding the tank in place is a single strap, secured by a bolt on the right hand side. Undo that bolt, and if there's a little gas in there, support the tank with a floor jack. Might help to put a piece of wood between the tank and the jack. Once you have the bolt out, lower the tank to the floor. The sending unit comes out if you grab the retaining ring with a locking pliers and give it a counterclockwise turn. Once you've got all that done, it's time to clean the tank. I just used soap and water, along with a little rubbing alchohol. It's something I see all the time on automotive message boards. Somebody has a car and a clearly defined performance goal. Only these goals really don't match the car. "I want my Daewoo Nubira to run 13 second quarter miles." Or maybe, "I want to make a Toyota Avalon handle well." Hot rodding is much easier when you use the right tool for the job. 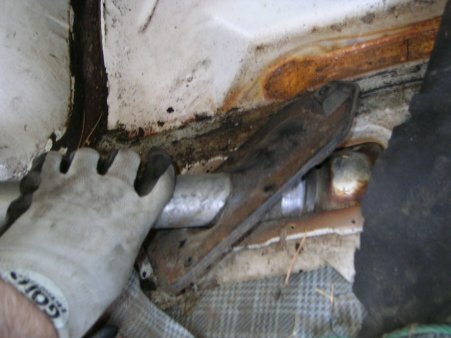 And one member on the Grassroots Motorsports message board likened those sorts of goals to using a shoe for a hammer. Are these the sorts of projects where it's better to just give up and get a more suitable car? Well, as you've seen from my blog, I have been busy trying to turbocharge a slant six powered Dodge Dart to make it hang with built V8's. And I've also put a fair amount of handling and braking mods on it. Obviously, I am not going to say others with equally unreasonable-seeming goals should always give up. Instead, I would urge anyone wanting to drive nails with a shoe to consider their motives, consider the costs, consider what the possible outcomes, and then decide if it's best to give up or to forge on ahead. And I'll be honest: Sometimes, it is best to give up before starting. First thing to consider is your motives for such an unusual project. Many times, the reason I hear is something like, "I can't afford to start with a different car," or, "I can get this car at such a bargain price." This is often the worst reason you can have for such an offbeat project. If there are no aftermarket or junkyard performance parts around, you can rack up a huge tab trying to fabricate and sort out custom built speed parts. About the only time this is going to save you money is if you are a fabrication genius who can build something like Denny Crabill's infamous V8 CRX. And if you've got that kind of skills, you probably wouldn't be asking what would be involved with your project. About the only time this can save money is if there is some little-known engine swap or performance varient of your car that you can raid for parts. For example, a Mitsubishi 4G63 engine from the turbo Eclipses fits into a Hyundai Excel. There are some better motives. For example, you may want to take on the challenge of building something off the beaten path. Or you may simply want something unique. Park a turbo slant six next to a similar car with smallblock V8 power at a car show, and you can guess which one will get the most looks from passersby. Whether the uniqueness is worth the price, or the challenge is something you can handle, is your call. Next thing to consider is the cost. This isn't just money, but also time and effort. There are no signposts when travelling off the beaten path. Engine and suspension tuning tend to involve trial and error, and in some cases that error part can mean breaking things. Or you may simply spend two or three times as long as it would take to get a bolt-on part in place. Big power gains on an engine with little aftermarket support tend to mean one of three possibilities: Turbo, supercharger, or engine swap. It is possible to put a junkyard turbo on an engine for under $1,000, or swap in an engine on a comparable budget, but you will really need to know what you are doing and have a fair amount of spare time on your hands. If you are hirign someone to do your work and using new parts, you may end up spending ten times as much. And when you're contemplating that sort of bill, you may find yourself wondering, "Now why didn't I just go with a 5.0 Mustang?" Or some similar common performance car. If you expect that question to haunt you, you might have chosen the wrong project. Handling can also be a bit of a problem. You can get just about any car to corner better if you can put some stickier tires on it and get some better shocks. However, many times you will need to monkey around with springs and anti-roll bars to get it to stop leaning over so much in corners. The good news is that you can have somebody make custom springs and anti-roll bars for any car imaginable. The bad news is that the wrong custom suspension bits can give a car evil handling quirks, like having the rear tires suddenly lose traction and spin the car out of control. If a good quality aftermarket company already makes these for your car, they may have tested things and found a combination that works well. If not, you'll have to do such testing yourself. That's likely to mean trying out seveal different set of springs and anti-roll bars, and probably different alignment settings too. Those extra parts can really drive up your budget. Then consider the outcome. Sometimes you may have the luxury of finding others who have done what you plan; I've had some help from other turbo slant six owners and others who have set up Dodge Darts to handle better. Other times you may only guess at what is likely to happen. Sometimes the only thing holding back a car is a lack of aftermarket, and you can make the car hang with other, more popular choices. Worst case is that you get a car that performs worse than before (a common result of tinkering with the handling if you don't know suspension theory) or becomes unreliable. If there is some real limitation built into the car holding you back, you may just end up with a whistling dog. It doesn't whistle very well, but it's remarkable that it can do that at all. I plan to campaign my Dodge Dart in Street Modified autocross once I'm done with it, and I know fully well that it may be something of a whistling dog there. I can probably get it to handle as well as a modified Fox-chassis Mustang, but getting it to handle like the tuner M3's that dominate Street Mod at the national level isn't likely at all. But (with apologies to Despair.com's Demotivators) if I can't get the car to do something well, at least I can enjoy having it do something badly. Only you can determine if your crazy project idea will be worth it to you at the end. But try to get all the facts and make an informed decision before you remove the first bolt. I've plumbed in the hose from the low pressure fuel pump to the surge tank today. Now the only fuel lines I have left to deal with are the return lines. Trouble is, the Dart doesn't exactly have a good spot to attach a return line to. I had been thinking of removing the sending unit and putting a hole in it for the return line, but I'm not sure it has room. 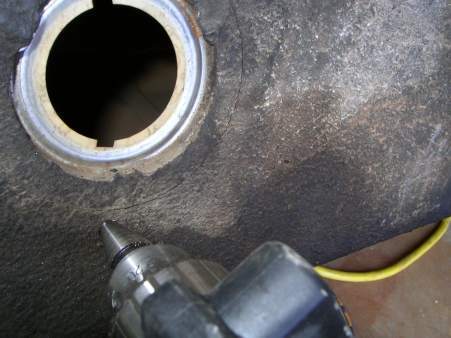 And I'm not too sure I want to drill a hole directly into the gas tank and risk having a spark ignite the fumes inside. Stay tuned and I'll try to solve this problem. I'm planning to remove the Windjammer from my CX500, as it keeps me from cooling off very well when riding around town. Unfortunately, the previous owner had cut up the stock fairing and turn signals to install it, so I'll need to track down some parts rather than just unbolting the thing. So I've been searching for parts. I found out that Rockdale Cycle on Highway 20 (just north of Conyers, Georgia) happens to be a motorcycle junkyard. Funny thing is, I'd driven past them several times and not realized that, since a motorcycle junkyard is a bit smaller than an automotive one, and they had a picket fence to hide the junked bikes from view. Last Friday, I stopped in and looked around their yard. Some of the yard consisted of parts removed from bikes and orgainzed by the type of part. There was a mountain of handlebars, a shed full of exhaust components, at least a dozen Windjammer upper fairings amid a mountain of touring fairings, and a semi truck trailer full of engines. They must have had at least a hundred relatively intact bikes there, almost all of them from the '70s and '80s. After looking at nearly all of them, I finally found the one CX500 in the whole yard. Imagine my shock when I found that this one was missing the parts I needed - because its previous owner had also cut it up to install a Windjammer!